Any time I'm with Isabel, I know food is going to be the center of our activities. And indeed, we ate some really delicious meals throughout the 12 days she was in Turkey. But one day topped them all - and maybe topped any other day of eating ever. 14 hours, 2 continents, starting with a $0.50 simit on the street and ending with a glass of cognac at one of the best restaurants in the city. On her last before heading home to NYC Isabel had booked us on a half-day Culinary Backstreets tour of two neighborhoods on two continents, Karakoy (Europe) and Kadikoy (Asia).We met our group of 8, plus guide Gonca, at 9am in Karakoy and didn't waste any time starting to eat. 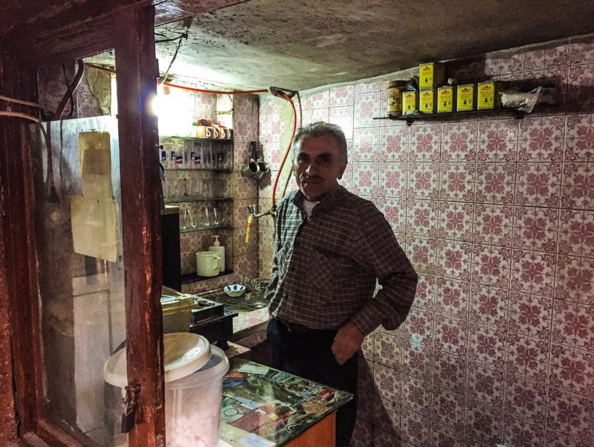 Gonca picked up simit, a sesame-covered bread ring, from her favorite guy on this side of the bridge and then we were off down alley ways filled with paint and hardware stores until we arrived at our first destination, a small tea shop in a hidden industrial courtyard. 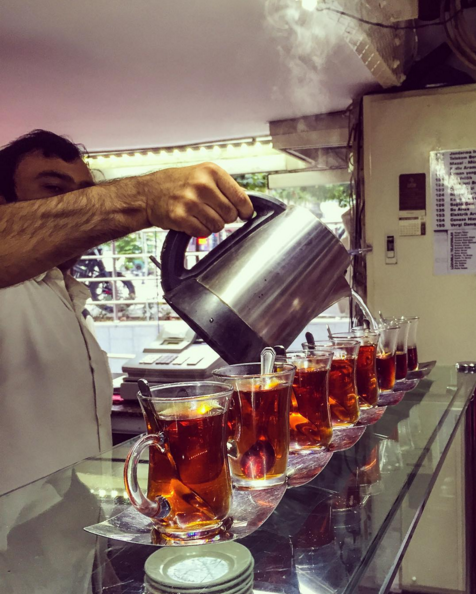 As the tea usta (master) served us, Gonca explained why Turkish cay, pronounced chai - is served in such small glasses (so it's always hot), how to tell if tea is good (clarity and color), and how to order. She also served us our first breakfast, simit and some funky and delicious local cheese she'd brought from a market near her home. This, she told us, was weekday breakfast - what Turks grab on the way to work. Our last two stops in Karakoy were for chocolates and baklava. Then we all hopped on the ferry across the Bosporus to the Kadikoy neighborhood, on the Asian side of the city. Kadikoy is both more traditionally Turkish (less tourists), but also incredibly hip (so many coffee shops, including one that's Breaking Bad-themed). Baklava drama: after a spat, the family split and now runs baklava shops with very similar names. This place wants you to know they are definitely NOT associated with the other one. 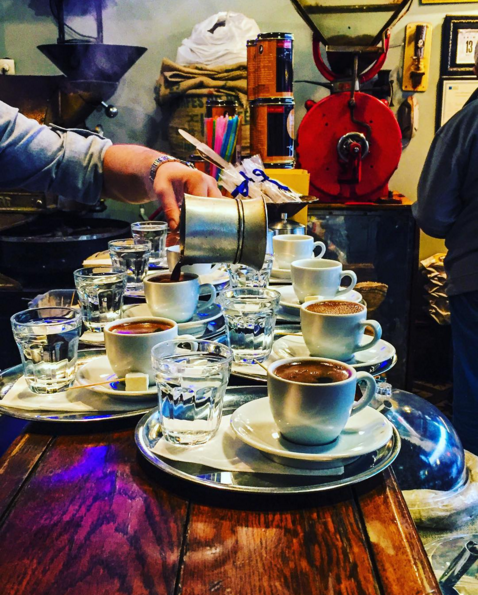 We made our way through the market, stopping to learn about what makes Turkish coffee Turkish (the coffee itself doesn't matter, it's about the brewing and drinking process), and popping into shops full of olives and pickles and other delicious bites to savor. We pulled some tables together at a corner market and sat down for some meze, freshly-fried and perfectly crisp hamsi (anchovies) and these insanely delicious mussels stuffed with savory rice. By this point, we were all getting really full. The food was too good to leave behind, which meant that we were eating more than was prudent on a 4-hour food tour. Also, it was clear this tour was going more than four hours. So by the time we got to the pide (Turkish pizza) stop, I honestly thought I might puke if I hate that cheese-laden dough. I know, it's a crime to leave pizza behind. But there was more food to be tasted! Tatuni is a little meat-filled roll stuffed with hot chili peppers - a Turkish mini-burrito. 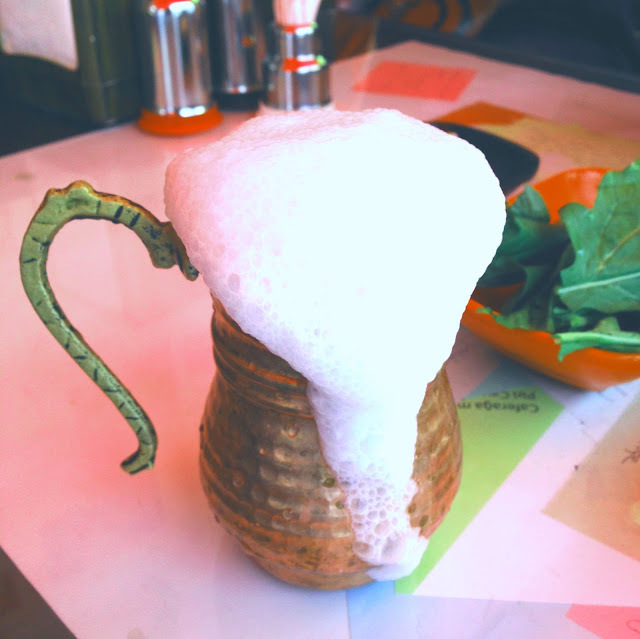 I might have over done it on the chiles, so I was particularly grateful for the copper mugs full of ayran, a salty watered-down yogurt drink. Ayran is acquired taste, I'm told, but it was really easy to acquire it when my mouth was on fire and the cooling yogurt was close at hand. Still two more stops to go! A lamb-intestine kebab was chopped up and grilled with herbs and fat and served on a soft roll - it was not terrible tasting, though I am not usually a fan of intestine, but I only took a few bites and fed the rest to some street cats - when stomach space is at a premium, you have to prioritize. Our final stop began with lentil soup (for the wimps like me) or tripe soup (for the brave like Isabel). Then we had tea (kind of cloudy, not the best quality - thanks Gonca for making me a tea snob!) and kunefe, a crispy baked cheese thing that we had tried first in Cappadocia and continued to be delighted by. In honer of Isabel's last night, we had planned dinner at one of the top-rated restaurants in Istanbul, Nicole. You can choose between the 6 or 8-course tasting menu, and I have never, EVER known Isabel to have less courses than were possibly available to her... so when I cautiously approached the topic of which meal we would choose while we were prepping for dinner, I was mentally preparing myself for an 8-course meal. When she agreed to the smaller menu, I breathed a huge sigh of relief! Isabel took almost all of the pictures at Nicole because she's better at food photography than I am. Suffice it to say that, even after eating more than I usually eat in a week on the food tour, this meal was a delight. Pretty plates, inventive ingredient combinations, an attentive waiter, delicious local wines, and a visit from the chef - a lovely woman who suggested several other great restaurants with lady chefs for me to try during my stay - made for such a special final evening on our vacation that not even the soaking rain on the walk home could dampen our spirits. 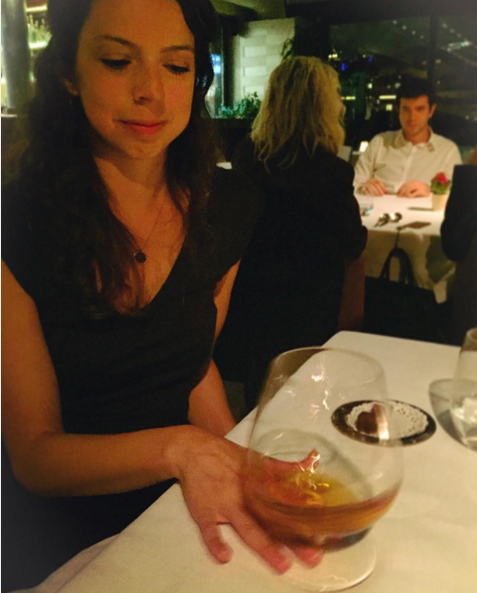 I did not actually order Hennessy at the end of the meal - Isabel did, cause she's more baller than me. But she let me give it a swirl. Also, note the guy in the background who looks like he's having the worst time ever. That table declined their amuse bouche (free amusing food! ), so you know they are not any fun. 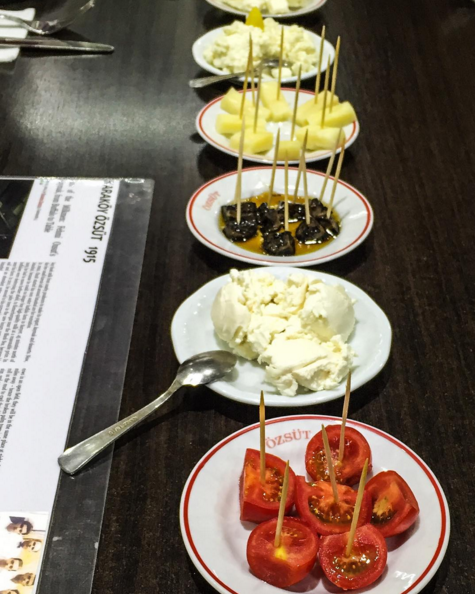 Culinary Backstreets offers a number of walking food tours in Istanbul. We had a small group of about 8, plus a local guide who was super knowledgeable and very passionate about food and sharing her culture. The tours aren't cheap, but it was absolutely worth it - and I say that as a very frugal person ;-) They also make a great introduction to the city, history and culture, so consider booking one early on in your trip! 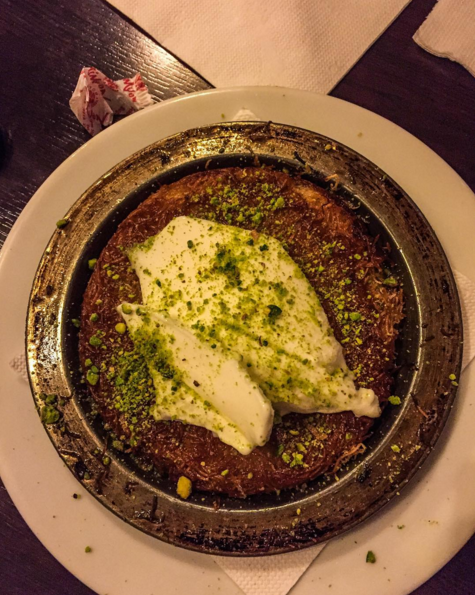 Nicole is located in the Cihangir neighborhood, near the popular Istiklal street. Reservations are recommended, but we were there during shoulder season and know some folks who were able to get in on a day's notice on a weeknight. If you like wine, be sure to do the wine pairing - all the wines are produced in Turkey, including some unique varietals, and they were unexpectedly delicious! Thanks to Iz for some of the pictures! Ah, I'm so jealous! 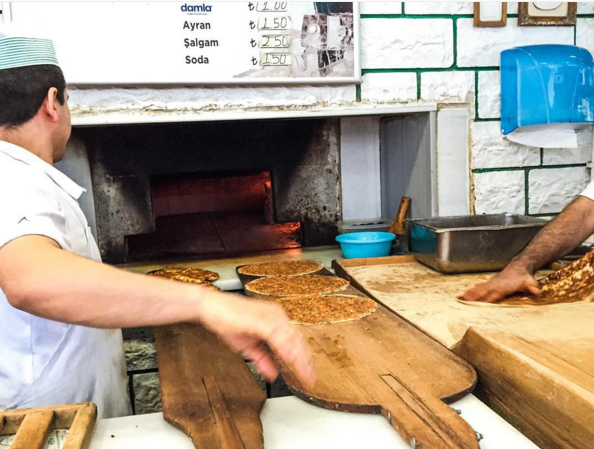 Istanbul, and especially the food there, is amazing. Especially the kunufe looks really delicious. I keep wondering about all of this tea you were drinking, how caffeinated is it? If people kept pouring me cups everywhere I went I would spend more time in bathrooms than anywhere else. oh it's pretty caffeinated. Your concerns are valid. Luckily the cups are tiny, but I still spent a fair amount of time in Turkish toilets.